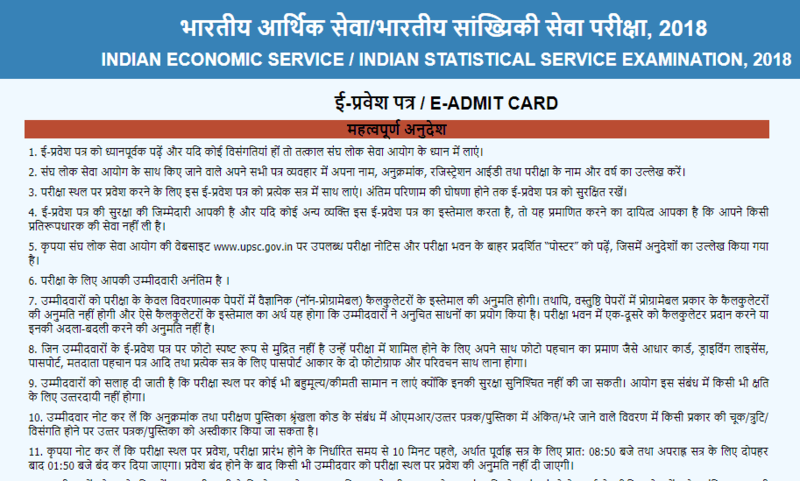 Union Public Service Commission has released admit card for Indian Statistical Services (ISS) and Indian Economic Services (IES) 2018.Candidates who have registered for the exam can download the admit card from the official website upsc.gov.in or a direct link of admit card given in this article. The admit card will be available till July 1, 2018. 'In case of any problem in downloading e-admit card for the Indian Economic Service / Indian Statistical Service Examination, 2018 or discrepancy noticed in the e-admit card , may please be informed in detail on e-mail: - uscms-upsc@nic.in,' reads the update on the admit card portal.